Heath Farm is a Victorian Pennine farmhouse that has been combined with the adjoining Jacobean barn to create this fabulous family home that offers something for everyone. FULL DESCRIPTION Heath Farm is a Victorian Pennine farmhouse that has been combined with the adjoining Jacobean barn to create this fabulous family home that offers something for everyone. It sits high upon the hillside and comes with a range of outbuildings which includes a substantial former farm building which now provides extensive garaging and storage, along with a detached partially converted cottage. There are ample gardens, parking and turning area, and the potential to take over the rental of some adjoining land from the Dartmouth Estate. ABOUT HEATH FARM This substantial rural property is accessed down a private lane off Highfield Road high upon the hillside above Slaithwaite. It has absolutely stunning panoramic views from its great vantage point and provides not only a wonderful family home, but a partially converted cottage which offers potential to create a little business from a holiday let, or even use as a home office, granny annexe, or hobby studio. The other much larger outbuilding also offers scope for a variety of alternative uses. The house has plenty of accommodation to make use of including a well fitted out dining/living kitchen, sitting room, study, utility and boiler room, hallway with w.c. and store room, and the almost 40ft long living/dining/games room created from the former adjoining barn which is open to the galleried landing above and the impressive roof timbers. On the first floor you will find a master bedroom suite with bathroom and dressing room, two further double bedrooms, house bathroom, and the long galleried landing leads across to the guest suite. A great purchase for those looking for a rural lifestyle, for those anchoring after being more self-sufficient, or even those purchasers with equestrian interests as the larger outbuilding could convert to stabling and the additional land on rent would provide an extra 2.5 acres (approx.). DINING KITCHEN 19' 2" x 17' 1" (5.84m x 5.21m) A good-sized room fitted with a range of wall and base units with matching glass fronted illuminated display cabinets, and having granite worktops incorporating a 1½ bowl stainless steel sink with mixer tap. There is a matching island with worktop extending to create a breakfast bar. Appliances include two electric Bosch ovens, and a Bosch 5-ring induction hob set into the chimney breast recess with drawers beneath and an extractor fan, light and oak lintel over. There are mullioned windows to the front offering far reaching views, window to the side, under unit enhancer lighting, oak flooring, beams, and even an original cupboard with restored natural wood doors. A door gives access to a staircase rising to the first floor. UTILITY ROOM 10' 2" x 7' 7" (3.1m x 2.31m) Fitted with a range of base units and ample work surfaces over incorporating a stainless-steel sink with mixer tap. There is plumbing for both a washing machine and dishwasher, wood effect flooring, roof window, and inset ceiling spotlights. A door leads through to the boiler room and store. SITTING ROOM 17' 1" x 17' 1" (5.21m x 5.21m) A relaxing reception room having a cast iron multi-fuel stove set into the original stone chimney breast with stone slab hearth. The mullioned windows to the front provide amazing views and there is an additional window to the side. There are exposed beams, fitted recess cupboard with natural wood doors, and access into the study. STUDY 10' 11" x 7' 7" (3.33m x 2.31m) With window and external door to the rear, roof window, ceiling spotlights, timber effect flooring, and access to a small cold store. INNER HALL Located between the farmhouse and converted barn is this inner hall which has tiled floor with under floor heating, external door to the rear with glazed side panel, ceiling spotlighting, and openings leading through to the substantial living area. There is also a downstairs w.c. and useful store room off this hallway. 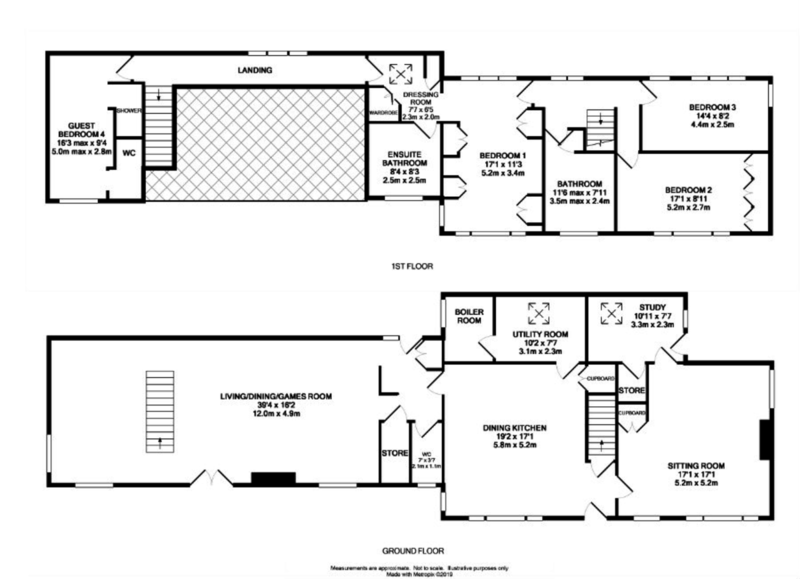 LIVING/DINING/GAMES ROOM 39' 4" x 16' 2" (11.99m x 4.93m) A fantastic room for entertaining which can all be used to suite your own requirements. It has glazed doors to the front within the original barn opening that provide those spectacular views, along with other former barn window openings. The room is open to the galleried landing above and up to the impressive roof timbers, beams, and apex windows. There is a multi-fuel stove set into the chimney breast with a raised stone hearth. It has a tiled floor with under floor heating. There is an impressive oak staircase with glazed panels rising up and extending across the galleried landing. LANDING The original farmhouse landing area gives access to the family bedrooms and bathroom. A door from the master suite dressing room can give access to the galleried landing within the barn conversion but the main access to the guest wing would be up the oak staircase. EN SUITE BATHROOM 8' 4" x 8' 3" (2.54m x 2.51m) Fitted with a white suite comprising a low flush w.c., wall mounted wash basin with mixer tap, and bath with mixer tap and hand-held shower head. The bath area has a tiled surround with an inset TV. You will also find tiled floor, part tiled walls, window to the front, a separate shower cubicle with mains shower over, ceiling spotlights, beam and a large ladder style radiator/towel warmer. BEDROOM 2 17' 1" x 8' 11" (5.21m x 2.72m) Another double bedroom with mullioned windows and views to the front. There is also fitted bedroom furniture. BEDROOM 3 14' 4" x 8' 2" (4.37m x 2.49m) The third double bedroom which also has some fitted furniture, and windows to the rear and side. HOUSE BATHROOM 11' 6" x 7' 11" (3.51m x 2.41m) Fitted with a white suite comprising a panelled bath with central mixer tap, wall mounted twin wash basin unit, low flush w.c., and a separate shower cubicle with a multi-jet shower system over. There are tiled walls to the shower cubicle and bath area, wood effect flooring, recessed storage cupboard, and a ladder style radiator/towel warmer. GUEST BEDROOM SUITE 16' 3" x 9' 4" (4.95m x 2.84m) A double bedroom at the opposite end of the property with windows front and rear. There are two openings behind the bed area, one leading to a showering area with tiled floor and walls, and the other leads to a w.c. and wall mounted wash basin. LOCATION From the mini roundabout in Slaithwaite go straight across and up under the railway viaduct and up to the junction at Hill Top Road. Turn left and then next right up Meal Hill Lane and follow the road right to the top. Turn right onto Moorside Lane heading towards Bolster Moor and the lane leading down to Heath Farm is a little way along on the right.